Between now and 2020, the amount of digital information created and replicated in the world will grow to almost 35 zettabytes, equivalent to a stack of DVDs reaching halfway to Mars. – Source: IDC, The Digital Decade, Are You Ready? Enterprises are equipped with a nearly infinite level of data. And when these companies can engage with this data efficiently, it – Drives profit, streamlines the entire organization’s workflow, and keep even the largest of the enterprise nimble enough to compete an industry’s newcomer. If an organization fails to choose or implement this system correctly, the data present will become a huge monster eating up the organization’s productivity and profits. This will happen unless you are not truly aware of search technology and the choices you will have to make in its implementation. There is a lot to manage in an enterprise’s data mine. Fulcrum Research claims that 80% of enterprise content is unstructured which is stored in applications like Word docs and pdfs, as opposed to structured databases, CRM systems, etc. The Forrester Research asserts that content volume is growing at a rate of 200% annually. The exponential growth of unstructured data is a reality and enterprises are facing a growing business challenge of leveraging this amount of data for insights. At this rate, the volume of the data stored in many companies will reach the point of – too much information. Where the amount of data is going to interfere with productivity rather than contributing to it. So, before you head towards the aspects of Enterprise search software, you should know the technology’s true importance. Let’s consider this scenario – An employee is looking for a piece of information, say a customer’s contact details. First, he searches in the CRM. Next, he looks in the Dropbox and continues to search in other enterprise applications. In the end, he pings his colleague to know if he knows anything about it. But both fail. This process happens multiple times a day throughout the organization decreasing the overall productivity. With enterprise search solution integrated into your system, you can easily type your query and it will fetch the correct information, present anywhere in the entire organization’s system. All of the data isn’t present in a single system. therefore, you will have to manually look for that information from various sources and application. But through search system you can easily look for this sitting on your system, and unify the data in your document. Suppose you are creating a new proposal for your new prospect. And you know creating proposal require a lot of information from a variety of sources. You will be needing inputs from your finance team, technical team, additional customer references, testimonials, case studies, and some more information. This will require a lot of time of a lot of people. Bringing down the overall productivity. Here a site search software can help you easily discover your specific data without wasting any time. The struggle and time required in data discovery and recovery, hinder decision makers from making completely data-driven decisions. The lack of a single search option also tends to decrease the employee’s productivity, because of the time and effort spent in finding the required information. An effective Enterprise search tool works like a single window view of all the enterprise data. It acts as a single point of contact for all the employees. They can access all the required information, making decision hassle-free and easily. IDC studies show, Effective search can help reduce 16% of time spent searching for information; the right enterprise search solution can add measurable value to the bottom line. 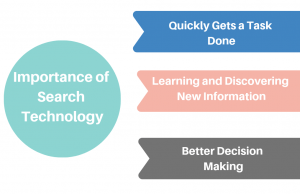 A right enterprise search technology can help employees free their time to analyze information, making useful decisions, and creating effective content. By minimizing unsuccessful searches and enabling employees to find information stored in diverse content repositories, enterprises will virtually eliminate the need to recreate existing content. The average interaction employee spends nearly 20% of the work week finding information or looking for colleagues who can help with specific tasks. Also, the employees today have to look among multiple data sources across systems to get a 360 degree view of reality during decision-making in order to get tasks done. Knowing how enterprise search technology is so effective, we have also listed out some of the biggest challenges that search technology can solve. Presently, the enterprise search tool is the solution to every challenge related to big data and data analysis that businesses face today. In this section, we look at major challenges that are real for businesses and how an effective enterprise search software can come to their rescue. Challenge: Enterprises have to deal with a lot of unstructured data that could be in any format and stored in any application. Thus, the biggest challenge lies in data analyzing it to recover the hidden insights. Solution: Enterprise search platforms have the potential to uncover these unstructured data with semantic technology. Semantic technology defines the unstructured data into entities classifying relations between them. Also it extracts facts, events, and attributes, and can give structure to this information. Challenge: Traditional search technology can go as far as matching the keywords entered by the users and fetching whichever information matches with the keyword. This ends up showing multiple results that might contain the keyword in a different context altogether, reducing the relevancy of the search. Solution: Enterprise Search tools semantic search and natural language processing technology can help analyze the meaning of the query and the intent of the user, before displaying the results. This result will be very different from the simple keyword query. Challenge:The data in an organization is not only of different formats, but is also unorganized and scattered. Managing this enormous amount of data and integrating them effectively for easy analysis is not easy. Solution: Enterprise search tools are designed for effective data integration. So that organizations no longer have to worry about managing diverse forms of data. Be it in an email, graph, news feed, or social media. These tools have plug-ins that collect the data from different sources and merging them into your vocabulary. Challenge: Scrolling through endless logs to look for particular information that is of importance, is a procedure that requires a lot of time and effort. As a result, enterprises fail to find the potential of this data and derive insights from it. Solution: The data search analytics feature in search technology provides real time powerful analytics that can help businesses uncover the potential hidden within the huge volumes of databases. The data presented from analytics can be used in informed and intelligent decision making for the business. But before you choose enterprise search technology for your business ask these key questions from the vendors. Before you set out to invest in an enterprise search tool, you should have an idea of the total quantity of data you’ll be dealing with. The types of data that you work on is important for all the functionality and features you are looking for in your enterprise search software. The search tool should be selected keeping in mind the areas where the data is located. Enterprise search tools are designed to cater to businesses from every industry and a tool that works for one industry very well might not be able to serve the needs of another industry. 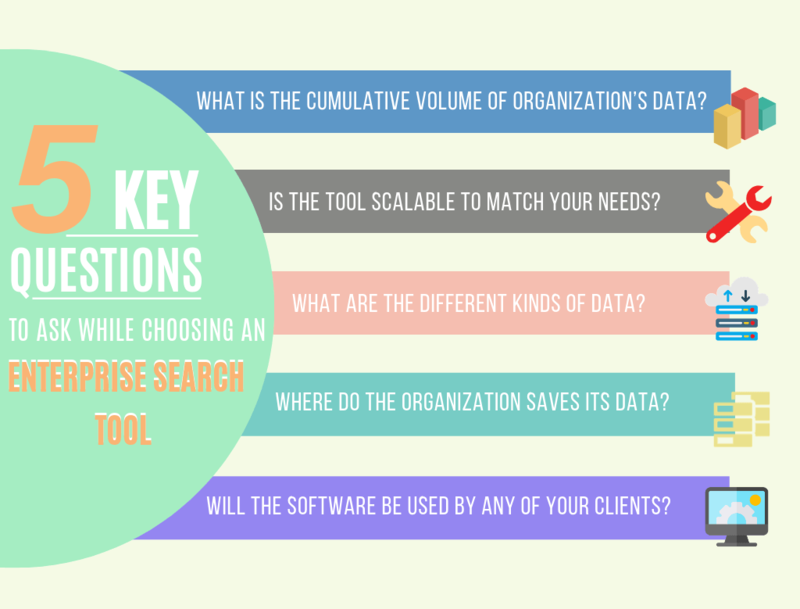 When you’ll be clear about these questions, you’ll find it easier to choose the right enterprise search tool for your organization. AI is surprisingly impacting everything around and search technology has not remained untouched. Employees who have been using corporate search solutions often struggle to find relevant information in an ever expanding unstructured sea of data. It is seen that this outdated solutions are dying and are being replaced by “Insights Engines”. Along with AI, search technology is also getting a twist because of open platforms, natural language processing, and Voice search. Let’s read a little more detail about these trends. Open-source engines are now in a lot of demand as they are helping enterprise customers cut costs and save time. Open source technology brings to us flexibility as well as better search functionality with no licensing costs. This is the reason that many organizations are not opting for traditional search technology. Enterprises are now adopting voice based search that can help employees to do quick searches. And also, access productivity apps by simply using voice command. The voice based technology is having a direct impact on employee engagement and is helping in saving time and money. According to Gartner’s enterprise search report, 80% of the data in an organization is unstructured meaning it does not adhere to the predetermined data models. These unorganized data results in ambiguity and irregularities that make it difficult to find solutions using traditional search programs. AI can help in this matter by automatically tagging the unstructured data and making it easily discoverable. Cognitive search also improves efficiency by knowing the intent of the query. By analyzing and learning from the past searches, the tool can identify the person who is looking for the information. And the type of content the person is expecting to find. Often video clips and images remain undiscoverable by traditional search systems. The reason is that multimedia creators fail to add enough description. AI tools automatically tag each file based on attributes facial, speech and object recognition technologies can identify. Thereby, creating discoverable multimedia content stores. Getting greater employee efficiency levels by providing quick access to relevant information organization wide. To learn more about the major benefits, you can read our Blog “4 major benefits of enterprise search implementation ”. Thousands of companies trust enterprise search solutions to deliver relevant and accurate results every day. Enterprise Search tools connect dozens of disconnected cloud platforms together and make them accessible from a single search tool. Employees can access that universe of data from anywhere, on any device, all in real time. Make this possible for your enterprises too. Get in touch with our experts and tell us all your search requirements. We will help you in selecting the right search tool according to your database.